253 "The visual metaphors of a map of the London Underground, and of seating in train carriages, structure the story immediately before, during and after a train crash"
Inside: A Journal of Dreams "The visual metaphor of a journal to structure the story of an old man's waking and dreaming life in a council flat"
Dreaming Methods "Dreaming Methods is a fusion of writing and atmospheric new media that explores digital storytelling, imaginary memories and dream-inspired states. All our work requires Flash Player 8 or higher." A critique discussing hyperfiction and one story specifically: to be read after class. Nab the Aquatic Invader! "is a fun way to learn about aquatic invaders. By using this site you can check out lots of unusual species that create real problems in the Atlantic, Pacific, Gulf, and Great Lakes regions." The Critique section is the equivalent of The Big Sell. It is the sort of information you would include in a sales presentation to your boss. The sale works on the principle that you create a product that people want, and that you sell it by telling them about all the sexiest features. Tip: it is easier to sell something if you "mirror" the potential buyer's vocabulary. Read the critique point for point. As each critique requires 200 words in total, each point must be answered in 50 words. She says, "Reading a fiction story on a computer screen is not fun"
SO we have to make our story "fun"
She says "Reading is sequential AND non-linear/Reading is filled with choices"
SO we give her sequential, non-linear AND boast about our choices. She mentions functionality "Forward/back buttons, menus, maps, visual signposting"
She says "Messy, confusing interface, Cluttered layout, Awkward navigation, Confusing nested frames"
SO we must avoid this, and say so! She says "Links are idiosyncratic;Not recognisable as links"
SO we must make sure ours are, and say how! She says "The print reader expects an ending - a fiction story runs along orderly lines to a satisfying end"
SO we mention our ending or endings. Remember to echo your lecture notes wherever possible. She says, "A news story tells the story of a recent sequence of events. The events are retold in a way which captures the most newsworthy or sensational aspect of the story first. Background is provided in the story, but the story will always return to a chronological retelling of the events." Keep this in mind. "2. Hierarchical organisation of story importance - headline size. 3. The information ‘slice’ on the front screen of the publication - a teaser enticing the reader to click to read more. 4. Chunking - the story is fragmented or segmented into different sections. 5. Cross-heads - the different sections of the story are signalled by cross-heads"
All things you might echo back in a critique. She says, "appropriate photographs, other graphics, and (if appropriate) video and sound," suggest these from Youtube and Wiki Commons and remember to add in citations for each one: title, URL, last accessed. She says, "You should explain why your online sources are credible information sources" so mention what satisfactions your sources have (first hand experience, how many years experience, professional standing etc) and also this should be mentioned in the text as readers like to know this too. Think: "says Dr Peam, a vet with 30 years experience," rather than "says veterinary surgeoun Dr Peam." She says, "You should explain why your writing style is appropriate for the written pieces in your feature package"
Mention your audience, mention angle and slant. If you use them, mention buzz words or popularity of topic. Mention architecture: internal and external links, layout for easy navigation, and mention the non-print media you might use like video and audio clips. You might add in a blog with three or four posts and discuss how this can help improve reader participation - and why this matters! For the last point, put in file name, the URL, and date accessed. Don't forget to talk about copyright and how you would need permission to publish if you were to put these pieces of work into the world rather than use them as an assignment. AND mention why the pictures you chose work for your pieces. See The Office for examples of bios here and teh NBC site which is interesting and corporate here, and for the much more innovative Dunder Mifflin site. Check Heroes official site for examples of how to interact with audiences here. Check the novels for inspiration. For the Critique, there are 4 points each of which must be dealt with in 50 words. It's straightforward stuff. But for point 1, remember to mention where you got the pictures you have used, their URLs, date accessed and don't forget to talk about copyright and how you would need permission to publish if you were to put these pieces of work into the world rather than use them as an assignment. AND mention why the pictures you chose work for your pieces. Eve ry day Target throws himself on top of me and sits with his eyes squeezed closed, purring loudly while I rub his ears. Life can be very good when you're a kitty. 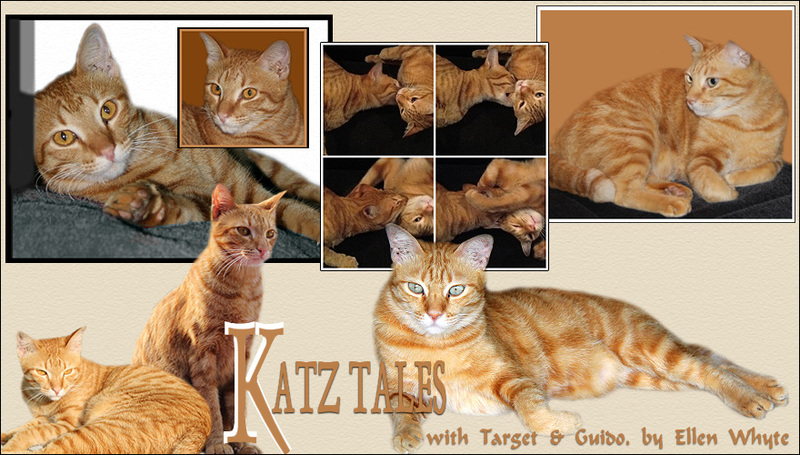 For more cats check out the sidebar of links; for more Cats on Tuesday check out Gattina. There are 3 little kittens out back with the stray cat colony. (this pic is of one of the tamer mums) A few weeks ago, they began to look crusty at the ears. I got some lotion from a cat rescue expert and tried to fix them up. Not easy as two out of three are feral. The tame one, the little black one got better almost instantly. But the two others deteriorated. It took me a while to catch them but yesterday I managed. I caught one with the aid of some prawns and a long, fast arm. The other, unfortunately, was so sick that I could just pick her up. We went to a new vet, Dr Bas in SS14/2, who treated the feisty one and said she'd be jumping about in no time. She was too. I just gave her breakfast and she's looking great. But the other little one is at death's door. She got some antibiotics and some other meds and I took her home. She's in my bathroom, wrapped up in a T-shirt. Last night she could move about. She wouldn't eat but she took some water. This morning she was stretched out flat on the floor. I thought she was dead but she made a little noise when I stroked her face. I've just given her some warm water, drop by drop through a syringe, and I have given her a rub down with a soft, dry cloth from face to tail. I'm trying to mimic a mother's rub down lick. Hopefully this will keep her insides working, and stimulate her will to live. I'll do it again in two hours. Then I have to go out, but I'll be back to do it all again in three hours after that. I hope this little one will make it. Purr for us please! Update: the kitten died at 1030AM. Sad day. Anyone who knows Au knows how passionate he is about his box. his upstairs box has been a fixture all the years we've lived here. Recently Au acquired an outside or garden box too. Now I am pleased to tell you that Au has a third box. This box is the downstairs box or living room box. It's new, cosy and has flaps to ensure a cat can have his privacy. A cat and his box: now there's a sight for sore eyes! Happy Cats on Tuesday everyone. For more kitties, check out the friends list on the left or visit Gattina. Dog Talk in the print version of The Star Weekender tomorrow stars Cash, a little fuzzy Shih-Tzu from the Klang Valley. She's the one with the green ribbons on the left, her friend Baby is the pretty one on the right, and the lap space is provided by Melissa. Cash isn't just cute, she was also the K9 Olympics Musical Chair Champion in 2007 and a Runner Up in 2008. Now Cash is thinking of becoming a canine beauty queen. Read all about her tomorrow. If you and your dog love to get out and compete, check out the Malaysian Dogathon held by The Students’ Society of Faculty of Veterinary Medicine at UPM that takes place tomorrow. Also, if you are thinking of getting a dog companion, please consider adopting Jingle. This pretty girl walked into Friends Furry Farm one dark and stormy night looking for shelter. She's 3 years old and is now looking for a forever home. She has a medium length silky coat and enjoys being with people. However, she is choosy about her dog companions. Jingle is spayed, vaccinated and heartworm prevented. If you want to adopt her, please email sabrinayeap AT gmail.com or sms to 016-6319018. When Target is bored he challenges Au to a duel. Target starts off the fight by growling, I'm going to GET YOU! Here I come! I'm coming to get you! I shall keep you away by sticking out my powerful back paw! But Au is a big boy and he pounces on our baby fluff in a blur of wicked speed. Luckily for Target Au is a nice cat who never takes rude advantage. We love to watch them play. It's so mock violent it's like watching the best combat scenes from a Jackie Chan movie - except live in our own home! On another topic, I'm updating my links. I've removed the Cats on Tuesday blog roll list in the side menu because many of the people listed don't appear to be taking part anymore. Also, many of the people I visit blog about cats but don't take part in COT. So I've made a Cat Friends list. This list consists of the visitors who come here frequently. If I've missed anyone out, please bug me about it! If you like Cats On Tuesday, check out Gattina's page. Today is the 8th day of the 8th month which has got to be lucky (if you're into Chinese culture that is) but I learned from our American blog pals this week that August 8th is also World Cat Day. Squizzle Target's chin until he falls over with purry happiness. Build Au a tent from newspaper and play the Fishing game with him. Roast chicken for their dinner. Bring out the feather duster and play wild games until the floor is covered with feathers. Open the front door and the sliding door at the same time so the cats can run circuits through the living room. What are you doing for World Cat Day? We're suffering from serious air pollution in Malaysia, thanks to open burning in our country and in Indonesia. An article in The Star this week noted the number of hotspots (IE fires) in Borneo ran to 877, with 383 detected in Sumatra. S0 we're coughing and there's a nasty taste to the air. But Au is very relaxed. He's snoozing in the smokey sunshine, happily getting his fur to record hot temperatures. We think he wants to be registered as his own little hotspot. By the way, we've heard from our American blog pals that it's World Cat Day tomorrow so we'll be putting in an extra post. Come and visit? Toes together, face tucked in, tail curled round... yup this dry practice run for my high dive is going really well! I've got tonnes of deadlines so today is a short one. Catch up with what's been going on Chez Au and Target on Friday. For more Cats on Tuesday, check out the list in the sidebar or visit Gattina.